BEST PRICE WITH BEST PRODUCT!! 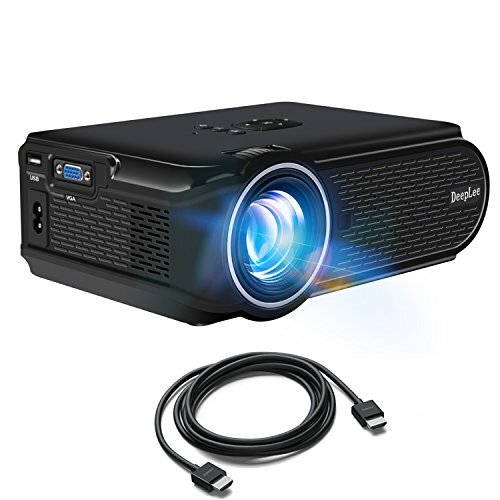 Can't find any mini projectors with 480p under $70!! What could you do with this projector? Movie night with your family, Video gaming with your buddies, Cartoon in the backyard with your kids, Viewing pictures/videos in the wedding... All the things you can image won't let you down with our projector DP90!!! Halloween decoration, Christmas decoration, even in birthday parties you could use projector DP90 to make something unforgettable!! What's more, DeepLee's new movie projector DP90 NOW ARE ON SALE!! Having a great moment with your family now!! ❿ Item Weight: 2.2 lbs. An MHL cable is needed! USB cable is NOT for phone/tablet mirroring. Kindly reminding this projector has 800 x 480p native resolution only. With 1500-lm brightness, we highly recommend it to use in DARK condition. If you have any questions about this product by Deeplee, contact us by completing and submitting the form below. If you are looking for a specif part number, please include it with your message.